Johnny McKnight’s pantomimes for the Tron have provided an annual blast of pop cultural fun. Determinedly hip and transgressive, McKnight revitalised slapstick humour and brought a fresh anarchic playfulness to the material. With McKnight performing in his other show in Stirling, it is largely Darren Brownlie’s forceful performance that drives this show, while McKnight’s formula shows signs of tiredness. The distinctive West Coast comedy remains the script’s greatest asset: mockery of working and middle-class stereotypes and the Glasgow patter deliver the best set-pieces, and Ross Brown’s compositions are elegantly crafted. 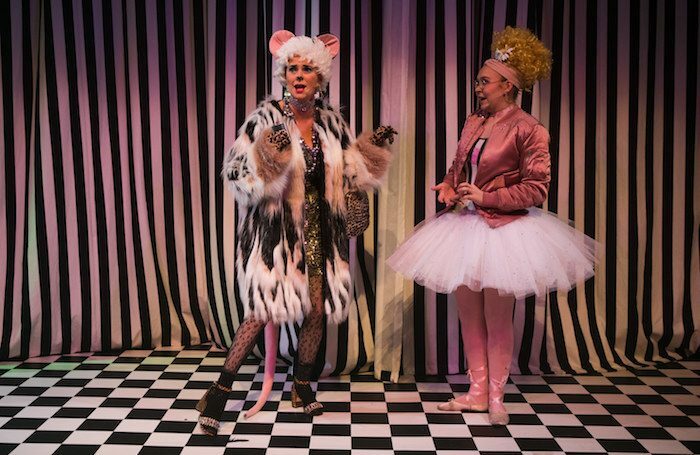 Unfortunately, some of the scenes between the heroine Alice (Daisy Ann Fletcher) and her BFF Catty (Julie Wilson Nimmo) drag, and the amplification necessary for the musical numbers transforms some comic turns into a screeching racket, obscuring the punchlines. An uneven structure dissipates the energy of the musical numbers and long sections discussing the nature of Weegieland undermine the fun. Alice in Weegieland retains the iconoclastic wit of earlier entries, yet lacks their energy and boldness: the ensemble is solid, Brownlie provides an outstanding pastiche of Glaswegian snobbery, but the shift towards predictably in the script make this a relatively disappointing outing that has moments of musical joy and good humour.